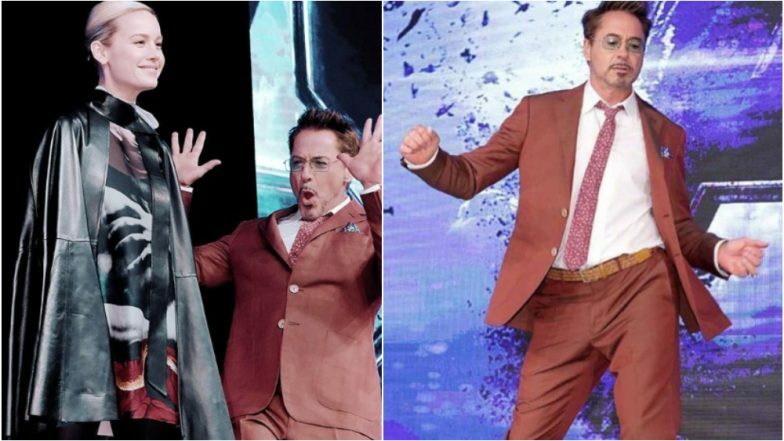 Avengers: Endgame: From Robert Downey Jr's Dance Moves to Brie Larson's Gorgeous Look, the Seoul Press Conference Was Truly Entertaining - View Pics! Avengers: Endgame is up for release in a couple of weeks and the team has been busy promoting the film across the globe. The directors Anthony and Joe Russo, and actors Robert Downey Jr, Brie Larson, and Jeremy Renner recently interacted with journalists at a press conference in Seoul. The event turned out to be massively entertaining what with Tony Stark aka Robert Downey Jr's dancing entry. Actress Brie Larson who cooked up a storm with her standalone film as Captain Marvel also interacted with the press and it was a delight to see her. At the press conference, the actors spoke about what they think of the fan theories that have been doing the rounds and Robert even spoke about his long-standing journey with Marvel, right from the first film, Iron Man in 2008, to the finale now. He also spoke about Brie Larson's brilliant work as Captain Marvel and the success of the film, he said, "Now, I honestly just feel like I get to be a part of witnessing this cultural moment that's coming up and I'm filled with a lot of gratitude. Just to be (here) next door to the centre stage, to the lady of the hour here (Larson), who's broken through this double-pane glass window and kind of re-established what this genre is supposed to be, is just very gratifying." Avengers: Endgame New TV Spot: 'This is the Fight of our Lives', Says Captain America and We're Pumped Up Already - Watch Video. Well, we certainly couldn't agree more. We are more than excited to see what Captain Marvel gets to do in Avengers: Endgame, after her badass work in the origins film. CONFIRMED! Salman Khan’s Bharat Trailer to Release Two Days Before Avengers Endgame. Avengers: Endgame is all set to release on April 26 and fans have been counting days to watch this finale. Considering this film marks the culmination of the Avengers franchise, it is going to be an emotional ride for Marvel fans. Recently, 20-minute footage of the film was shown at a press junket in South Korea and the response has been incredible. How excited are you to catch Avengers: Endgame in a couple of weeks?